By Julia Gamolina, cover photo by Jesse Winter Jenny E. Sabin is an architectural designer whose work is at the forefront of a new direction for 21st century architectural practice — one that investigates the intersections of architecture and science, and applies insights and theories from biology and mathematics to the design of material structures. Sabin is the Arthur L. and Isabel B. Wiesenberger Associate Professor in the area of Design and Emerging Technologies and the newly appointed Director of Graduate Studies in the Department of Architecture at Cornell University where she established a new advanced research degree in Architectural Science with concentration in Matter Design Computation. 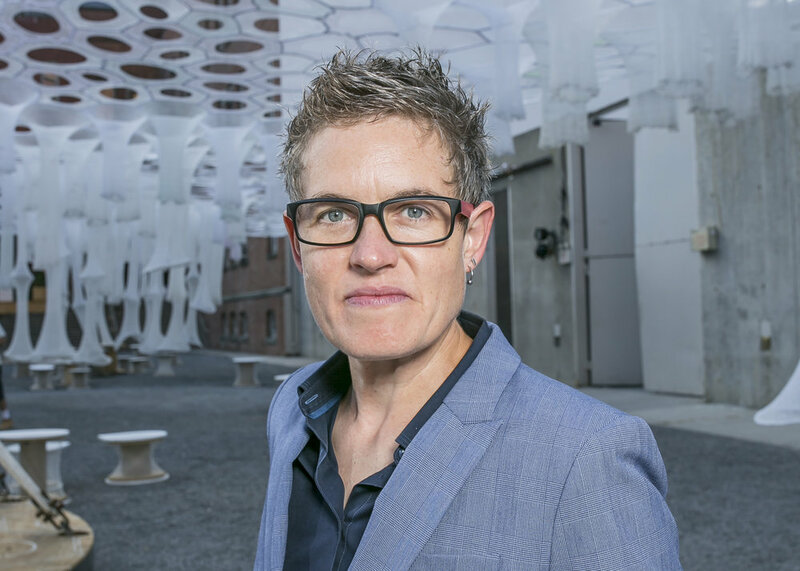 She is principal of Jenny Sabin Studio, an experimental architectural design studio based in Ithaca and Director of the Sabin Lab at Cornell AAP, a trans-disciplinary design research lab with specialization in computational design, data visualization, and digital fabrication. 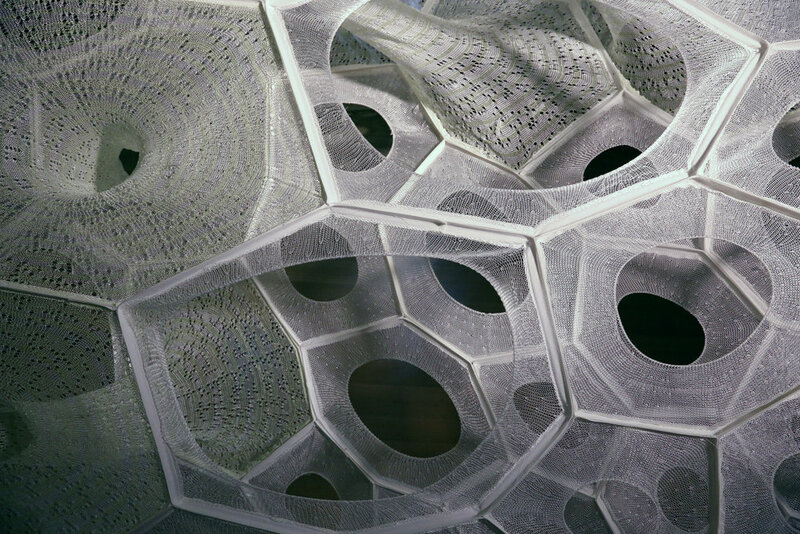 Last year, Sabin won the internationally acclaimed MoMA & MoMA PS1 Young Architects Program with her submission, Lumen. In 2006, she co-founded the Sabin+Jones LabStudio, a hybrid research and design unit, together with biologist, Peter Lloyd Jones. Sabin is also a founding member of the Nonlinear Systems Organization (NSO), a research group started by Cecil Balmond at PennDesign, where she was Senior Researcher and Director of Research. Sabin’s collaborative research including bioinspired adaptive materials and 3D geometric assemblies has been funded substantially by the National Science Foundation with applied projects commissioned by diverse clients including Nike Inc., Autodesk, the Cooper Hewitt Smithsonian Design Museum, the American Philosophical Society Museum, the Museum of Craft and Design, the Philadelphia Redevelopment Authority and the Exploratorium. Sabin holds degrees in ceramics and interdisciplinary visual art from the University of Washington and a master of architecture from the University of Pennsylvania where she was awarded the AIA Henry Adams first prize medal and the Arthur Spayd Brooke gold medal for distinguished work in architectural design, 2005. JG: How did your interest in architecture develop? JS: My foundation is in the fine arts – I have a BFA in ceramics and a BA in interdisciplinary visual arts – but I actually started college in biochemistry. I think I was rebelling against my parents, who are both artists [laughs], but I’ve always been very interested in the intersections between mathematics, sciences and the arts. When I graduated, I started a studio practice, and worked at the Seattle Art Museum during the day to pay the bills. I was the Director of Admissions, managing the front end of the museum - the ticket sales, volunteers who ran the coat check, all that – and the largest budget within the museum. I learned how to manage people during that time, and how to manage funds – it was a very informative job. Then at night, I would work in my art studio. I did that for almost four years and had a series of exhibitions. However, I was really overwhelmed by the fact that I had unlimited choices in art, and I became paralyzed by that. I longed for more constraints and more parameters, my work was really invested in looking at intersections across disciplines, and architecture kept coming up. I also really longed to have the potential for more collaborations, so I decided to pursue my graduate work in architecture, applied to a number of places, and decided to go to Penn in Philadelphia. Tell me about your early experiences in the field. I was fortunate to be at PennDesign when the architecture department was undergoing the transition into the digital realm, much earlier than many other schools. The first half of my education was analog – drawing with a mayline, ink on mylar, and lots of physical models, which was a good fit for me coming from the fine arts – and then the second half of my education was all about writing scripts, studying under people like Cecil Balmond, and being exposed to the critical and conceptual approach to the digital in architecture. I did well and made some great friendships with faculty since I was an older student, so when I graduated I was invited by the chair at the time, Detlef Mertins, to teach! It was one of those phone calls I will never forget, he asked me if I’d be interested in teaching the first-year foundation studio in the grad program, and to co-teach with Cecil Balmond in the Spring an upper level research studio – an incredible opportunity. I accepted and ended up teaching at Penn for six years, co-teaching with Cecil for four of them. Cecil is in many ways my most important mentor – he’s a structural engineer and runs his own studio and was deputy director of Arup where he launched an innovative research group, the Advanced Geometry Unit. He’s a real pioneer in the area of form and algorithm. He was working on massive projects, like CCTV, and a series of the Serpentine pavilions, and bringing that thinking back to the studios. I learned a great deal from him and other colleagues who were at PennDesign at the time. While you were at Penn, you started LabStudio. How did this come about? There are a lot of buzzwords out there around “interdisciplinary” and “transdisciplinary,” and “design thinking, but when it gets down to it, to actually collaborate is really hard because there are different structures in place for how we publish, how we garner funds, how we teach, even how we conduct our days. When I look back on the last twelve years of work across disciplines, that investment of time was so critical - we generated a new model for communicating and conducting research across disciplinary boundaries. What was a key project within LabStudio? In 2010 we received our first National Science Foundation grant within their emerging frontiers for research innovation. Before that, there were a lot of naysayers on my side and on my collaborator’s side saying, “Why would you do this with an architect.” Now this crazy! The positive institutional stamp from the NSF, which indicated “This is important work,” really elevated the stature of the work and how it was being perceived by other colleagues. The grant was for our Eskin project along with another longtime collaborator and materials scientist, Shu Yang, which was looking at adaptive materials and the potential for buildings to behave more like organisms, adapting to their environment. We proposed to integrate adaptive thin-film technology into either existing construction or new façade design that was bio-inspired, and would work across multiple scales and disciplines. How did you finally end up teaching at Cornell? There came a point when I realized I needed to leave Penn and the timing was good to put myself on the academic job market. I was interested in a tenure track position and Cornell made me an incredible offer – that was another phone call I’ll never forget, from Andrea Simitch. I started at Cornell in the Fall of 2011. At that point, the work that I was doing, in collaboration with Peter and others, had been substantiated. When I came to Cornell in 2011, I was at the halfway point of the Eskin project and was able to bring that funding to Cornell. I was also able to bring one of the key people and collaborators that was part of the team, Andrew Lucia. I really hit the ground running at Cornell, and established the Sabin Design Lab. In 2013, with Shu, the materials scientist who was part of Eskin, and some new collaborators, including Dan Luo, we successfully procured another multi-million dollar grant from the NSF this time looking at kirigami, which is a particular geometry that is like origami, but has the addition of cuts and holes. We are in year four of that grant, currently. Where are you in your career at this moment? After thirteen years of work in collaboration across disciplines, my research, projects, and teaching, which investigate the intersections of architecture and science, applying insights and theories from biology and mathematics to the design of material structures, are each reaching a level of maturation and are making impact at the architectural scale. This is very exciting to me. On a professional level, I just received my tenure. It’s definitely an important milestone in terms of what I’m contributing in the context of teaching and research. My projects and research keep me going and keep me excited, but in terms of long-term impact, I think I’m giving the most through my teaching, giving people the opportunity to think a little bit differently and to then go out into the world and do amazing things. Projects like Lumen, which is very much in the spirit of the Young Architects Program (YAP), are a synthesis of ten years of deep inquiry into matrix-biology, material science, bio-engineering, physics, engineering and collaborating and thinking across disciplines. Working with scientists for so many years now has made me a better and more rigorous architect. I’m currently teaching in our Cornell AAP Rome program where I have introduced students to generative and computational design through the lens of Rome’s incredible layered and material complexity. The title of the studio is “Post-Digital Rome: The Complexity of Part to Whole”. Students started by selecting a case study from ancient to late medieval Roman architecture to explore part-to-whole relationships within masonry structures, such as bricks. They did this with digital tools and through the design of their own scripts. This has now informed a generative strategy for their final projects. What are some of the biggest challenges that you’ve faced? The biggest challenge has been crafting a new model for research and practice across disciplines as there aren’t many precedents - this can sometimes be lonely and really exhausting. I never tried to put myself into a box, so I think that’s been important to my success, but also difficult. Also, because what I do is a new model, I do work three full time jobs [laughs]. I’m working on how to make this more sustainable in the long term, and hopefully get a bit more sleep! A lot of architects struggle with this, especially if you have small practices and also teach – we’ve been institutionalized to work all the time [laughs]. What have been some highlights and what are you most proud of? Our first NSF grant was pretty important. Some of the projects that we have done that have been huge highlights for me have been Branching Morphogenesis, which made the cover of Science Magazine in 2008. Receiving the Pew Fellowship in 2010 and the US Artists Fellowship in 2011 was rewarding too. In my last year of teaching at Penn, I received the teaching award that students vote on, and that actually meant a tremendous amount to me, because I take teaching very seriously. Within teaching, launching the new program in Matter Design Computation at Cornell Architecture marks over a decade of work now formalized into a structured degree. My first student started last fall with full funding from Autodesk, so their tuition is covered, and they get a stipend while they are here. I’m proud to formalize my work into a degree in which students can do research in my lab, produce a thesis, get free tuition, and get paid for their work and their studies! This kind of set-up happens all the time in the sciences and I always thought, “Why can’t that happen in architecture?” Teaching is number one for me, I think it always will be. And, of course, winning MoMA & MoMA PS1’s YAP program was a big highlight! It’s interesting, when I first came to New York City, in the 90s, a friend took me to PS1. I think it was before they actually did the architecture installations, but Warm Up had started already and we attended one summer Saturday afternoon. I was blown away by PS1 and thought it was an incredible space, so I have such a strong association with of my first visit and experience to New York City through PS1, so to have come full circle and be able to win YAP with Lumen has many layers of meaning to it for me. And meeting my wife and partner, Katherine Sender! That’s been huge [laughs]. What advice would you give to those just starting their careers and trying to find their niche? My advice is to remain open and to not feel like you have to prescribe to the linear model that architecture has mandated for so many years - that you go to school, intern, get your hours, take your tests, get licensed, and become a project architect. This professional model is important, but there are other models as well. Try to engage in a diverse range of experiences, whether it’s interning at a large corporate office, or working at a small experimental office where you may get to see a project through from design to fabrication. Exposing oneself to a range of experiences and professional environments is super important. And to ask questions and to watch how people work! Don’t necessarily try to emulate the work, but watch how people work – how principals run their practice, how someone directs their lab. That’s what I want the people who work for me, both in my lab at Cornell and for my studio, to take away. Sure, they’re being influenced by the thinking and the work that I’m doing, but most importantly what I hope they take away is how I work and interact with people. I’m really just super excited about the maturation of the work. I’m very comfortable with the experimental and with not necessarily knowing where the work is going – which not everyone is [laughs]. Especially architects. I see the studio practice continuing to really grow. It’s always been my goal to push the work into architecture and to realize it at an architectural scale, and it’s starting to edge into that. I now have several projects in my practice that will be permanently built. The new degree in Matter Design Computation is also helping to structure next steps in my lab at Cornell. What has been your general approach to your career? It’s certainly been a process – I’ve had to craft a new model, and there wasn’t a precedent to follow. At times, that has been quite lonely because you don’t necessarily have someone to rely on to help you with questions. That new model, in terms of a career, is really about forming hybrids – how does one operate as an architect collaborating with scientists, while also having one foot very clearly in the academy, running a lab and teaching full-time, and one foot very firmly in a practice? I owe so much to my scientific collaborators and important mentors. Crafting that model is a project in itself, and an ongoing one. It’s certainly not easy – I frequently feel like I have three full-time jobs. The success I’ve been able to have has also been a slow process – it certainly didn’t happen overnight, it’s taken a lot of work and commitment. Fundamentally it’s been about forming friendships with collaborators that I trust over the long-term, some of which have come from just walking across the street and knocking on someone’s door that you wouldn’t normally venture into, the building you wouldn’t normally frequent. My approach has been rooted in a commitment to remaining open, remaining curious, and not being afraid to look outside of one’s discipline and practice.